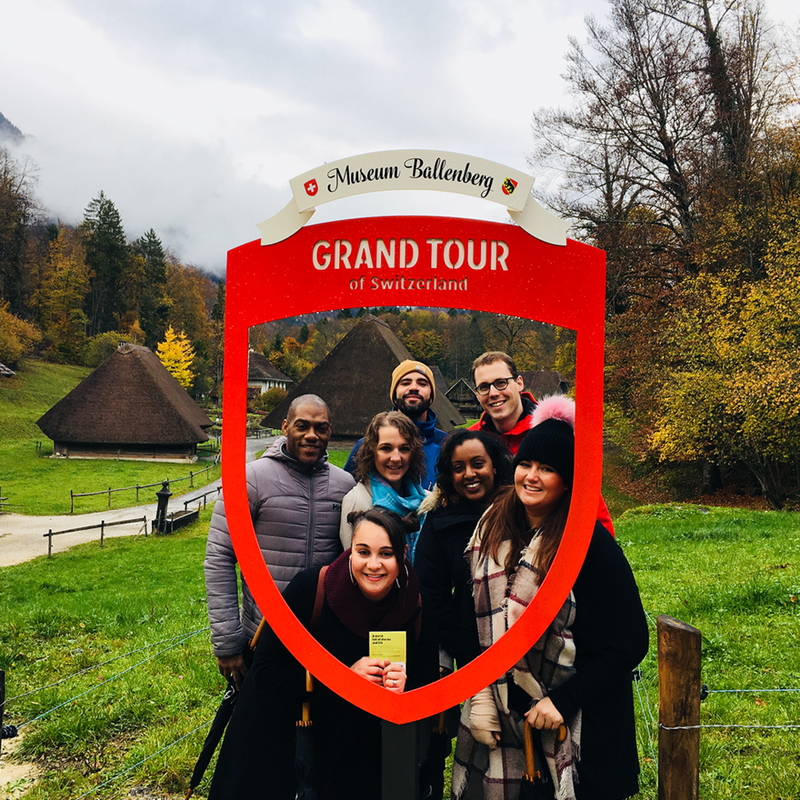 Continuing our Destination blog series, this week our Project Manager, Cherry Dalton brings you an account of her recent FAM trip to Switzerland with the Switzerland Convention and Incentive Bureau. I'm the lucky one that was fortunate enough to go on a FAM trip to Switzerland, very last minute. Here is a taster of what Switzerland has to offer incentive groups as a destination. We had all been added to a WhatsApp group prior to agreeing to meet at the gate at 8:20am. The text read ‘I’m standing by the gate in a red Switzerland jacket, looking forward to meeting all of you’. It sounds like I am exaggerating when I say the ‘red coat brigade’ were out in force that day, but every group leader and their assistant’s in their red coats were there with their clipboards waiting for groups to board the flight and start their exciting journey to the Swiss Alps! Luckily, we all managed to find our leader Livio and travel to Zurich in style aboard Swiss Air. Once we arrived at the airport we headed straight to Sprüngli train station to pick up some deli fresh sandwiches and board to train. The train station is located within a stone’s throw away from the arrivals gate, and I would highly recommend travelling by train in a country as beautiful and diverse as Switzerland. The number of wow’s and ooo’s that the group had was great, we couldn’t decide what side to sit because we were jumping across the aisle each time we saw a breath-taking mountain or a chocolate box picturesque house…the views are amazing! Once we arrived at our destination in Interlaken, we were a short walk from our hotel, the absolutely stunning Victoria – Jungfray Grand Hotel and Spa. The hotel was as grand as it looked on the outside on the inside. Fountains and balcony’s front the purpose built hotel that has history spanning more than 150 years. The hotel screams tradition and modernity, and I’ve not experienced somewhere that has managed to balance such different tastes quite so well. When we were greeted with a hot fruit tea and a welcome pack including a map of the local area and some sun cream for our trip the following day, I knew the hotel wouldn’t be scrimping on their hospitality either. We had some free time to relax and unpack before we met in the hotel lobby for our traditional Swiss dinner planned that evening at Restaurant Laterne. A lovely cosy table laid up with ramekins of the unknown….it looked like it was going to be an exciting dinner! I have a lot to say about the Swiss cuisine. Mainly the amount of cheese (WOW)! Two courses of cheese and wine is anyone’s dream right? The next day was the part of the itinerary we were all ridiculously excited for….our guided excursion to Schilthorn. If you haven’t heard of Schilthorn before, I can honestly say it is one of the most amazing places I have ever been lucky enough to visit. Another train journey through mountains with waterfalls, next to rivers of crystal clear water and the odd sight of a goat made it another journey plentiful of adventure. Two trains, one bus and 5 cable carts later and we had arrived at the top of the world! The secret to where Windows get their wallpaper backgrounds. Later on that afternoon we went back to the hotel to relax in the spa and have some free time before dinner. Today was our last day in Switzerland, which was sad but we were all excited about our trip to Ballenberg, to the open air museum. We didn’t really know what to expect, but it was a great trip full of history and culture. I couldn’t quite believe that the houses that had been donated to the museum are donated brick by brick and rebuilt. The detail is unbelievable, and it was lovely to see some of the crafts still being used such as bread making and hats! After a brisk walk around the museum and some lunch it was time to head back to Zurich airport to get our flights back to London. All in all, Switzerland is a beautiful country with so much to see and do. I would will anyone I meet to visit, and experience the places I was lucky to visit. Thanks to DMC (SCIB) and everyone on the trip that made it memorable and fun.